Covered Button Pony Tail Holders & Snap Clips for a customer! So many different projects going on at the same, which is good for me in order to keep motivated and complete orders, above are some completed bows that I made for my neice and some of my friends daughter and me messing with selective coloring--I love the black and white photos and having a pop of color here and there! I've also been keeping up w/ the quilt along--still working on my nine patch Amanda Jean! I've decided it will not be a twin size, but rather a crib or lap--I don't think I have the strength to make a twin on top of several other quilts and crib set orders that I need to complete. Off to post the photo in my flickr group! Those bows are so cute! Nine patches are fun to make. Beautiful hair accessories! Your models are really cute too. Your daughter has the prettiest curls. you are really doing well with your new bow making...very cute all of them. you are a pro already with the bows. I LOVE the rag bows, going to have to experiment with that. I did some of the covered button for clips too, love that amy butler. I love your new talent! Those are the cutest! Beautiful hair pieces and I like the blues in the blocks! oh, youre pics are so great! i love the little hair clippies- too cute! Oh, my goodness!! Who designed your new blog look? It's gorgeous! I shouldn't be surprised since everything in your blog is eye candy--so colorful and pretty!! Love the button hair clips and your rag hair accessories. You are so talented! 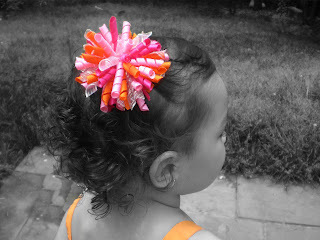 I loved all the hair bows, and clips. I just love those rag bows. They are just so cute. I love these! I have a new granddaughter who is 5 months old and has no hair! But, when she gets hair, I can't wait to see her in beautiful bows like these! Great job! You have been busy! All are gorgeous and will make someone very happy!